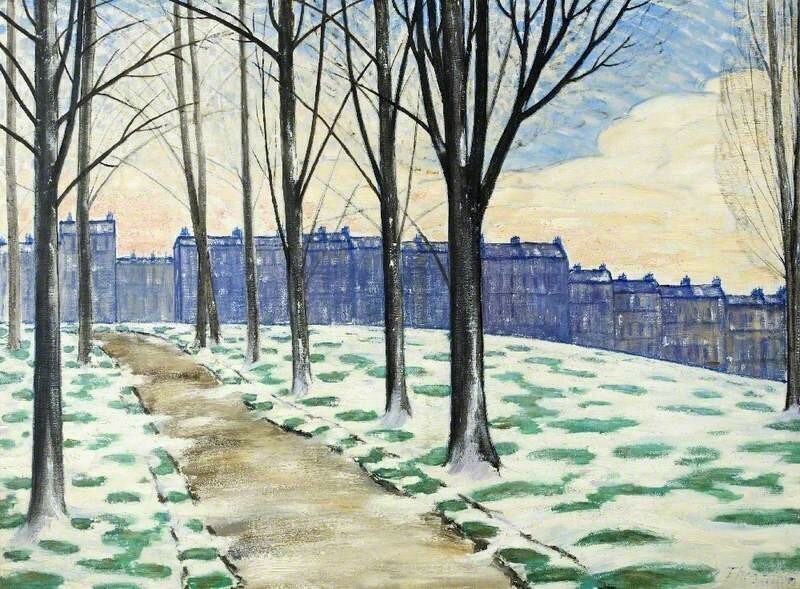 When I first went to work at Cheltenham Art Gallery & Museum, in 1973, I quickly became intrigued by the oil paintings of Alfred Thornton – born 1863, died 1939. There were three works – ‘En Provence’, ‘Hill-Farm, Painswick’, and the one I mainly discuss to-day ‘Melting Snow’ (although originally titled ‘Thaw’). I was intrigued by how apparently different they all were. Exploring the biography of the artist gave me some clues to the mystery. The work ‘En Provence’, dated 1919, is a clear echo of Thornton’s days in France and his enthusiasm for French artists such as Monet, Sisley , and Gauguin with whom he painted in Brittany. Whilst Gauguin went off to Tahiti, Thornton settled back into the different scenery, and society, of the Cotswolds – but continuing to be firmly rooted in avant-garde movements in London. 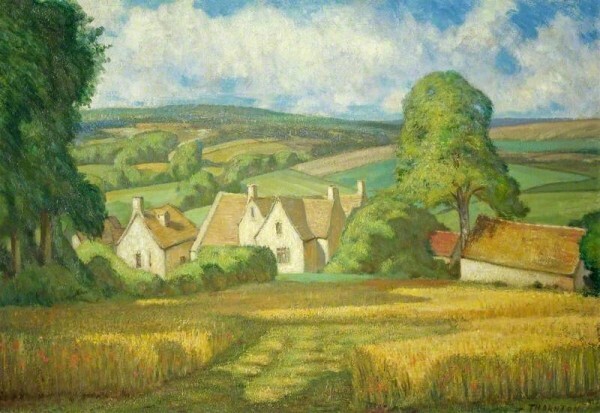 The work ‘Hill-Farm, Painswick’, of the 1930’s, can be seen as a re-orientation, a coming to terms with a society and a landscape which differed from his earlier days in France. In this respect he echoed his contemporary, and fellow Cotswold inhabitant, William Rothenstein. 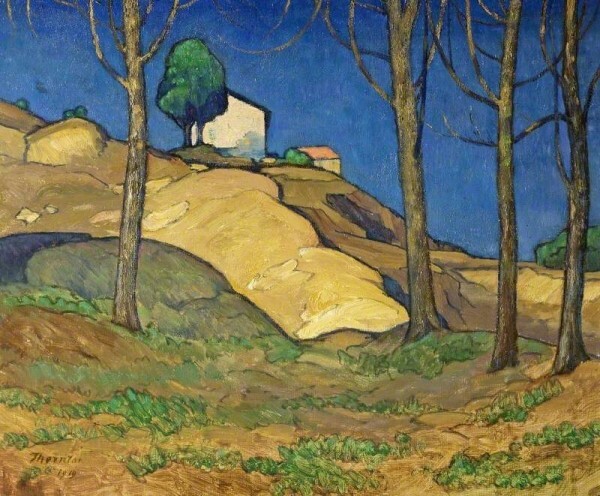 But what about ‘Melting Snow’, of about 1920, it echoes his use of colour and form, and his application of paint, as seen in ‘En Provence’. This is not a view in the Cotswolds. The nearest I can get relates to his staying in Bath around this time – the tall terraced houses on a hill-side could very well be in that city. The simple and bold colouring and brush-work is startling – but rather, perhaps because of the backs of a terrace of housing, rather boring. This work was the first Thornton oil painting to enter the collection being a gift from the artist in 1923. The offer was made by the artist to the Librarian Curator at Cheltenham, Daniel Herdman. Both seemed to have come to Gloucestershire at much the same time – but I have a strong feeling that they were already on friendly terms. I suggest this friendship started in London – Thornton was very active in the London progressive art scene and Herdman was a frequent visitor to London and himself was familiar with contemporary artists. Herdman was clearly keen to expand the Art Gallery collection – including work by modern British artists and artists working in Gloucestershire. This ambition of Herdman’s had to contend with a rather conservative Borough Council – but one who generally backed Herdman’s choices. vaccine friendly doctor database table on Which Penley artist?